When you press and hold an icon on your iOS (iPhone / iPad / iPod) device's home screen, you'll get the ability to rearrange the icons or uninstall the app associated with it. That's really boring and not the interesting part I want you to focus on. The interesting part is what these icons do as a result of you pressing and holding. They wobble and jiggle (aka wobiggle) around. It's pretty awesome. In my very humble opinion, I think this implementation is really REALLY close to what you see on an iOS device. Anyway, in this deconstruction, you will learn all about how this effect works. It's going to be a lotta fun. Before you proceed, just make sure you are up-to-date on your knowledge of CSS Animations and working with nth-child selectors. Otherwise, your fun will be lessened by a great deal of confusion and possibly crying. You have been warned. Take a few moments and glance through all of this. Don't worry if everything doesn't make sense yet. That's what the remaining sections are there to help you out with. Before we get to the implementation details, let's take a few steps back and look at what exactly this animation is doing. As you will see soon enough, this animation really isn't doing much, for the wobble is really nothing more than a rotation. Srsly! Notice that our object is still rotating. It is just that what it is rotating around isn't the center point anymore. To describe it more formally, the transformation point is no longer the center of the object. The transformation point is shifted up and to the left. This subtle change allows your rotation to look a bit more like the wobble effect that you see on the iOS icons. Of course, this isn't everything. There is a little bit more to your animation like the duration and easing function, but we'll look at them shortly...in the next section! Take a few more moments to read through the CSS. Nothing should be too surprising, but let's look at the interesting parts of this. The only line to call out here is the transform-origin property. This is the very important property (VIP) that allows you to specify the center point where a transformation such as your rotate will actually take place. 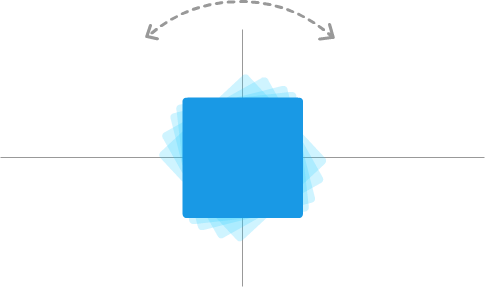 It is this property that offsets your icon's transformation point and turns your simple rotation into a slight wobble. Now, the challenge with implementing this effect entirely in CSS is that you can't really have randomness in how things move. Everything has to be predetermined. Despite this constraint, there are a few things you can do to help make each image wobble with a little uniqueness so that you don't get something that looks really mechanical and fake. The first (and most obvious) of the few things is that, if you look at your CSS, you'll notice that I don't have just a single animation declaration and corresponding keyframes. Instead, I have two of each. Notice that there are subtle differences in each of the variants. In one animation, you rotate from -1 degrees to 1.5 degrees. In the other, you rotate from 1 degree to -1.5 degrees. 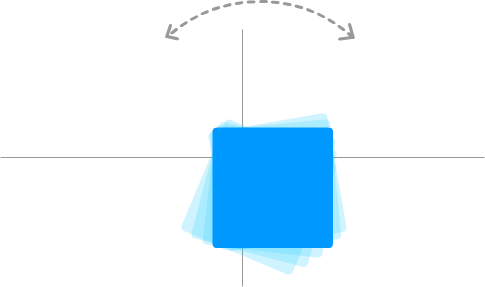 The transform-origin property that determines the center point of your rotation is also different, and one of the animations is set to alternate its direction. Which element gets which animation version is handled by the nth-child pseudoselector that is happily attached to the #main .icon style rules. The nth-child selector with 2n will select every even numbered element. The nth-child selector with 2n-1 will select every odd numbered element. The end result is that every icon will alternatively get one variant of the animation declaration. Unfortunately, having each icon animate in one of two ways isn't different enough. You'll quickly find yourself staring at a wall of icons that move in-sync. That isn't going to look nice, and we certainly don't want to bloat our CSS with a lot of slightly different copies of what we already have right now. The two copies we have right now are a bit overkill! Altering Some CSS Properties and their Values...Inline! Notice that each img element has the animation-delay property and animation-duration properties set to slightly different values. A negative value for the animation-delay property determines how many seconds into the animation to actually start playing. It's basically an offset. The animation-duration property is more easy to comprehend. It specifies how long the animation will actually play. By altering the values on these two properties for each element, I am able to ensure a certain level of non-uniformity in how the animation plays across all of the icons. This combined with our alternating animation variants, you get a pretty compelling simulation of random behavior entirely done using only CSS. It is an off-center rotation. That's it. The iOS wobble effect, as you can see, is pretty straightforward (and little less exciting) once you simplify the animation down to its technical parts. In fact, the bulk of the markup isn't actually there to re-create the effect. Most of what you see is devoted entirely towards helping all of our icons move in a slightly unique way...aka trying to fake randomness using CSS.